Graham set us the task of bringing a ‘triumphant fourth album’ to the latest meeting and seeing as Paris 1919 had been on ‘the list’ since we started (as has Music for a New Society, but I haven’t felt mean enough to inflict that on my fellow members yet! ), I thought it an excellent opportunity to treat them to what is, perhaps, John Cale’s most surprising, in some ways most disorientating and definitely most accessible offering. As Mr Cale himself states in his autobiography, What’s Welsh for Zen, ‘Paris 1919 was an example of the nicest ways of saying something really ugly’. It’s the lushness of the sound, the sweetness of the songs, the warmth of the recording that is so unsettling not, perhaps, so much in itself but when placed within the context of John Cale’s career. After all, Cale was the man who gave the Velvets their visceral cutting edge: the screeching voila on The Black Angel’s Death Song, Sister Ray’s thrillingly exhausting battle for supremacy between Reed’s guitar and Cale’s organ, I Heard Her Call My Name’s cacophony. 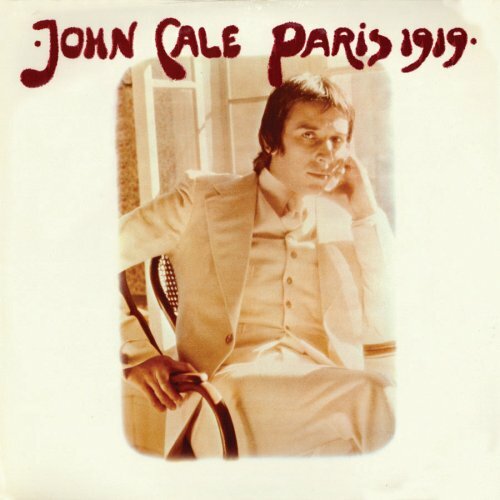 Cale’s post Paris 1919 output is, in many ways, just as challenging, never more so than on the aforementioned (totally harrowing) Music for a New Society. So it is a little unnerving to find this concise, perfectly formed treasure trove of sweet sounding songs nestling in the heart of Cale’s discography. It was interesting to see the surprise on the faces of my fellow club members as Child’s Christmas in Wales (a ‘jaunty’ little number) led into the beautiful, yet jarring, Hanky Panky Nohow. I guess they were expecting something much more obviously challenging and discordant. Yet not far beneath the surface, dark forces are at play and whilst I have no idea what any of the songs mean, I can’t help sensing they are much more macabre than they initially appear. Cale’s lyrics are so oblique and cryptic on Paris 1919 – it is immediately obvious that these are not the random warblings of some 1960s acid casualty but skillfully constructed pieces that are packed with meaning but only decipherable by those with the intelligence, patience and motivation to do so. I’ve never bothered (or don’t have the capability! ), but I am intrigued by lyrics such as ‘elephants that sing to feed the cows that agriculture won’t allow’, from Hanky Panky Nohow (why ‘Nohow’ not ‘Knowhow’?). And why is he welcoming the subject in ‘Graham Greene’ back to ‘Chipping and Sodbury’? It’s a rare occurrence for me that I pay much attention at all to lyrics; normally words in songs are there to carry melody and emotion for me, not meaning, but I find everything about Paris 1919 beguiling and the more I listen to it the more I realise that it offers so much more than what appears, on the surface, to be nine lovely, if somewhat odd, little pop songs. Rob listened: I’ve heard parts of this before, although Tom doesn’t remember playing it. He was drunk at the time and had just recovered from a fit of the vapours having accidentally flashed the inner sleeve of ‘Bummed’ to a room full of sensitive Totnesians. I liked it then and liked it more this time. It seemed to have an exquisite balance between the restraint and delicacy of pastoral folk and the underlying sense that its subject matter was curdling away and turning things bad. Lovely stuff and definitely one i’ll look to get. Also amusing to note that the first artists we all thought it reminded us of turned out, without intent, to be Welsh (Gorky’s, SFA…). Something in the water or an enduring Cale influence in those parts? Nick listened: (Whisper it) I’m not a massive Velvets fan. The eponymous album with I’m Set Free on it is very nice, and bits of the banana one are quite good, and I’m sure at the time they were pretty radical / cool / shocking / etc etc. I own White Light / White Heat but I can’t remember a damn thing about it. So I’ve never investigated post-Velvets solo work by the members, except for Transformer, which my brother bought me, and which, two famous songs besides, I think is complete bobbins. This, though, makes me interested to hear more of Cale’s solo work; it’s tuneful, beautifully arranged, intelligent, inscrutable, and enjoyable to listen to. I’d only ever vaguely recognised that Cale was Welsh, but it definitely makes sense hearing this and knowing that Gork’s and SFA are fans. A good choice. Graham Listened: Now, way back, I probably liked the Velvets and Lou Reed a bit too much, and took it all a bit too seriously. I never really followed John Cale’s solo work, but I had a perception it would all be a bit too strange for me. Well, then Tom plays this! Nick has really said it all about the impression it made on me and it really drew me in. I found “jaunty” as an apt description on the night.